We need a whole thread just to bask in the Clarke-tech awesomeness of graphene. Material and engineering researchers at East China’s Zhejiang University unveiled a “super” aluminum-graphene battery that can be fully charged in 5 seconds and then last for two hours. They claim to have developed a novel aluminum-graphene battery that is more cold-resistant, can work in temperatures ranging from -40 C to 120 C and is less flammable. The battery, which has a positive pole made up of graphene thin film and a negative pole of aluminum, can retain 91 percent of its capacity even after 250,000 charge/discharge circles, a marked improvement compared with the lithium battery. And there was something I saw a few weeks ago, about graphene sneakers. Welcome to 2018. Thanks for that. Try to google for spider silk enhanced with graphene, that experiment was really something. Btw Iam starting to see graphene almost everywhere lately. Its really a very versatile material. If you wanna have a basic overview, try this blog. There is all the basic info. Less than 20 years after it was developed, a thin, resilient sheet of carbon atoms with remarkable properties known as graphene is transforming biomedical fields as far flung as tissue engineering, neuroprosthetics and drug discovery. Because it readily conducts heat and electricity, graphene also may be a good biosensor. But it’s not neutral. When Vanderbilt University scientists tried to use graphene to measure electrical activity in the brain, they found that it actually enhanced nerve cell signaling. It did so by enabling nerve cell membranes to pull in more cholesterol. The fatty substance was used to make more of the vesicles that package neurotransmitters, the chemical messengers that relay signals between nerve cells. More vesicles and more neurotransmitter meant stronger signals. These findings, reported in the journal Nature Communications ("Membrane cholesterol mediates the cellular effects of monolayer graphene substrates"), came as a complete surprise to the investigators. They raise the possibility that graphene may enable researchers to change how cells communicate with each other by manipulating the cholesterol content in the cell membrane. The fourth power is quite intriguing. 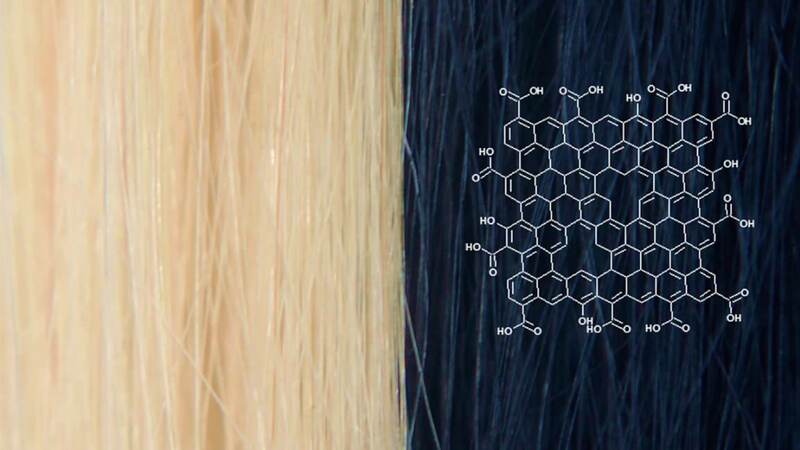 The Northwestern team mentions that your graphene-treated hair will be able to interface with electronic components, since the coating can carry an electrical current.